When one stands back at looks at Bernadine's life and work, it becomes obvious that at the heart of everything she does (whether it be art, writing, or educating), she is a teacher. Not the kind who asserts knowledge of facts like a Grade 10 Math teacher or truths like guru Wayne Dyer (bless his soul). Bernadine is the type of teacher who will present something and ask only that you look at it and decide for yourself what it may or may not mean to you. 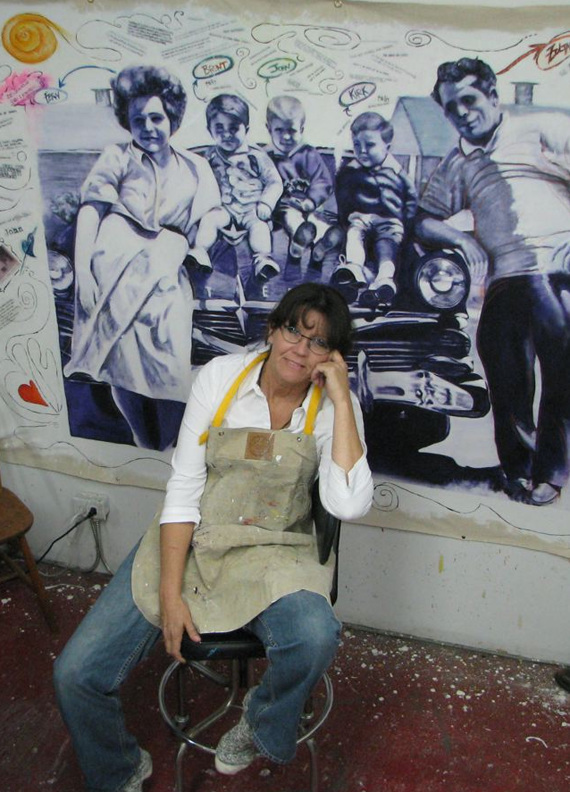 experiences as the subject matter of her work. In fact, if one was to gather all of her art, writing, and speaking engagement topics one could collect it under one heading: This is My Story. Her writing simplifies and articulates complex ideas and interactions. Her art demands us to utilize our nonverbal language and have a conversation with parts of our brain we may have forgotten. Her speaking engagements come directly out of her life experiences and are focused on social activism. All of it is meant to create social change. Bernadine uses images, words, and her voice to touch this world and leaving it in a better place. Bernadine pulls the subject matter for her work right out of her own life. In short? Bernadine Fox was born on the bald flat prairie of Alberta Canada. At sixteen, she escaped a wretched childhood by moving to a first nations reserve with her partner, had a baby, became a single parent, got married and had another baby, left her husband, moved to Vancouver, became a social activist around sexual abuse in the 80s, put herself through art school (Emily Carr) in Film and Animation, was engaged to a fellow animator, went into the animation and then film industry in Vancouver as production co-ordinator and manager, then left to work with survivors (like herself) of extreme childhood trauma and organized crime, engaged in social activism and lectured throughout Canada and the USA on the issue of trauma, was exploited by her therapist (childhood victims are vulnerable to unscrupulous therapists), bought a house, developed myalgic encephalomyelitis (more commonly known as Chronic Fatigue) and spent a year or more before she could get out of bed. Two years later, her oldest daughter's drug addiction meant she became the single grandparent to her 2-year old grandchild. She re-entered Emily Carr and received her BFA and took up life as an artist. She extricated herself from the abusive therapist who transgressed too many boundaries to mention who then attempted to silence her with emotional and financial battering. (See Memoir) She survived, but destroyed several relationships with friends and lovers trying to resume normal life. She took up painting (as far as CFS allows), exhibited her work in public and private shows & galleries, juried exhibitions and curated others, facilitated an expressive arts group in the DTES for Westcoast Mental Health Network at Gallery Gachet, created a discussion group about art called "Speaking of Art," fell in love again, got engaged, broke up, and slowly recognized why she is doing this work and why it is important that she continue to her art, her writing, and her social activism: as a culturist - this world is important to her and she uses her creative talents and her ability to teach to provide her audience with new ideas. Wanna read the long form of this bio? Go here. 2 : an advocate of culture or of a particular method of cultivating mind or body.